Cyn.in helps people to work together - that is the key function of cyn.in. Since version 1.0, we gathered from our users, the most used feature of cyn.in was commenting. cyn.in has essentially become the ‘place’ where you put the stuff you want to work on with someone else. And the way to work with that some one else is (apart from co - editing the same file of course) is via commenting. The best thing about collaborating via comments is the fact that the comments always remain attached to the content (or the context) of the stuff that you were working on. Its always search-able and reference-able by any body else that is interested in or joins the team. 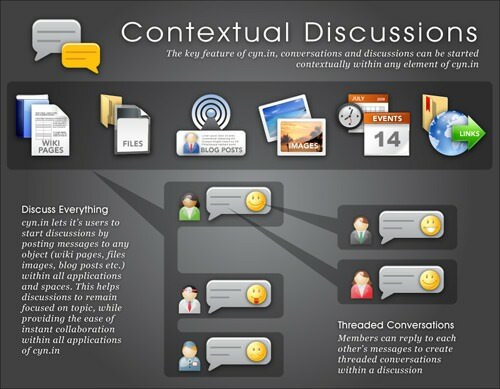 It’s Contextual - This helps keeping the conversation focused, and helps avoid the pitfalls that modern collaboration systems like instant messaging have often faced in the enterprise scenario; of being a ‘time waster’ or a ‘distraction causer’. With cyn.in 2.1, and the upcoming cyn.in desktop, we are taking discussions to the next level - Cyn.in 2.1 introduces big improvements in the user experience of the discussions system. Ajax based commenting interfaces along with threaded conversations makes commenting a breeze. One of the key capabilities of the cyn.in desktop is going to be able to very very easily comment of stuff from your desktop, without even navigating to the web interfaces. The cyn.in desktop will offer a very familiar and similar experience to instant messaging software, with the key difference of the ‘roster’ or the ‘buddy list’ being replaced by the activity stream of content from your cyn.in site. The cyn.in desktop v1.0 beta will be released simultaneously along with cyn.in v2.1. It’s quite clear now that discussions in cyn.in is a key area of focus for the cyn.in design team, and you will see a lot more interesting innovations in this area, in the near future.